Private security officers and their supporters marched May 24 through downtown Oakland, Calif., past the high-rise commercial office buildings they work to protect, to demand decent wages, affordable family health care and respect. A master contract covering 5,000 security officers employed by leading security companies in San Francisco, the East Bay area and Contra Costa County expires June 30. 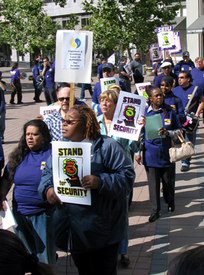 The march was the start of a “Stand for Security Contract Campaign” by the Service Employees International Union, Local 24/7. At a brief rally before the march workers heard pledges of support from Sharon Cornu, president of the Alameda County Central Labor Council and from Oakland City Council members Jane Brunner and Jean Quan. The union pointed out that if the workers received just $1 an hour more in wages, paid leave and family health care, nearly $430 million a year could be infused into some of the Bay Area’s most economically depressed neighborhoods, where most security officers live. With overwhelming bipartisan support, but at the price of funding the Iraq war without a “date certain” for withdrawal, the Democratic-controlled Congress voted May 24 to raise the minimum wage. The hike, from the present $5.15 an hour to $7.25 an hour, to take place in three stages over a little more than two years, would be the first in over 10 years. The minimum wage increase was part of a package of domestic measures, such as continuing aid for Hurricane Katrina victims, that the House passed 348-73. All 73 “no” votes were cast by Republicans. The entire package of domestic issues was then tacked onto the bill funding the Iraq war, which had passed 280-142, mostly on Republican votes. The Senate, however, combined both the Iraqi troop funding and the minimum wage hike — which also included $4 billion in business tax breaks that Bush demanded — into one package. It passed overwhelmingly, 80-14. Though they face an uphill battle in a top federal court, leaders of unions representing 700,000 civilian Defense Department workers will fight to overturn rules recently imposed by the Department of Homeland Security. The rules give managers unlimited discretion over hiring, firing, pay, work rules, promotions, transfers and everything else, all in the name of “national security.” The rules also strip whistleblowers of their protection. The rules had been repealed by the House, but a three-judge panel reinstated them. The unions plan to lobby the Senate so that it, too, goes on record against the rules. The unions have said that theirs is a battle to protect not just defense workers, but all workers, union and nonunion. “You can sugarcoat this all you want, but it’s the Bush administration’s intent to get rid of unions and break the back of the American people, period,” said Richard Brown of the National Federation of Federal Employees. If union contracts covering thousands of registered nurses in Minnesota are any indication, U.S. hospitals may have a tougher time than they expect trying to declare that nurses are “supervisors” not protected by labor law. In contracts covering more than 10,000 nurses in the Twin Cities, the key point was not the pay or benefits, though those were important, but that hospital management either lost, or didn’t even try to raise, the “supervisor” issue. In ballots counted May 17, registered nurses approved contracts with 13 Twin Cities hospitals, including important provisions to protect their right to a union. The pacts with the Minnesota Nurses Association cover 10,750 RNs. The pacts came just months after the Bush-named majority on the National Labor Relations Board ruled nurses could be “supervisors,” and stripped of their right to unionize under labor law, because they are “charge nurses” or perform other “supervisory” duties for as little as 10-15 percent of their time. This Week in Labor is compiled by John Wojcik (jwojcik @pww.org). Marilyn Bechtel and Press Associates Inc. contributed.